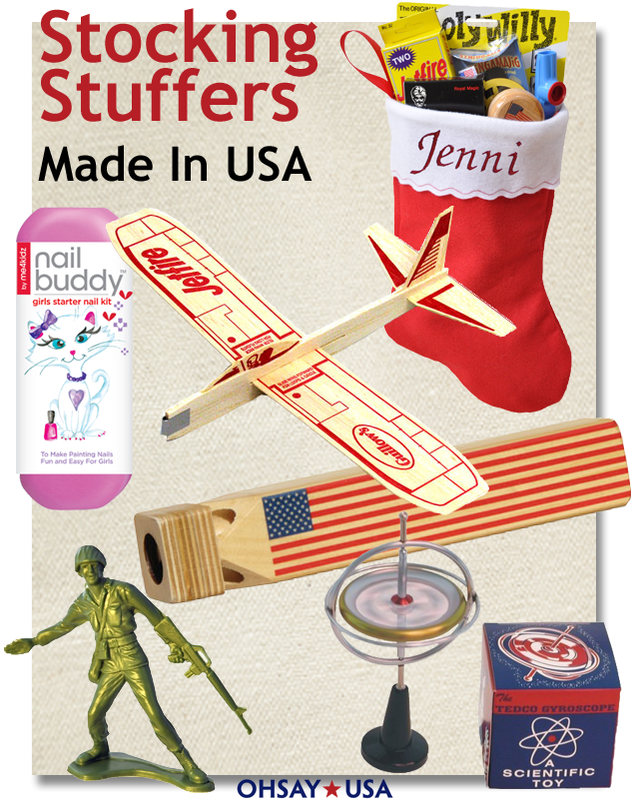 Delight the kids with a USA-made Christmas stocking filled with 8 toys from all over America. Each toy included is unique and is kid approved. This is the original Guillow's Balsa Wood glider that started it all more than half a century ago. The Jetfire! We give you TWO USA made Jetfire Gliders so that you can share with a friend. They soar up to 25 feet. This Girl's Starter Nail Kit is fun for Moms, Grandmothers and daughters to do together. Girls love to own their personal kit nail kit instead of borrowing Mom's supplies. This USA made Flag Train Whistle sounds just like a real honest-to-goodness train. Crafted from responsibly harvested pine and high quality birch plywood. Toddler & Children's hickory striped overalls and train conductor hat also available to complete the set. They are back! This bag of 100 plastic army guys is proudly Made in USA. There are 12 different figures and all your old favorites are included. Packed in a box reminiscent of the package from the 1950's, this is the original Made in USA toy gyroscope first produced in 1917. Pull the string to start the wheel spinning. The gyroscope will balance on a pencil point, a string, the tip of your finger, or just about anywhere!